The TI-5032 is one of the typical battery operated desktop printers sold by Texas Instruments. It traces back to the orginal design introduced already in the year 1983 and the similar TI-5024. View the first TI-5032 here or the intermediate TI-5027 and TI-5029. Don't miss the Privileg LP31, obviously manufactured by the same contract manufacturer that did the TI-5032. Don't miss the TI-5032 SVC manufactured in 2000. 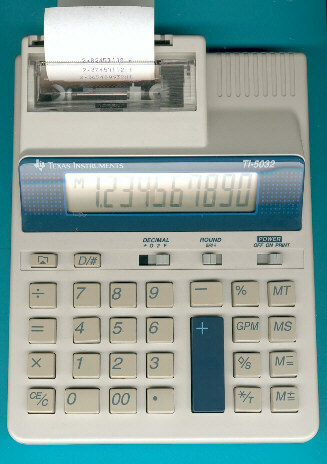 The TI-5032 is featured in the Texas Instruments Incorporated sales catalog CL-1233 dated 1994.